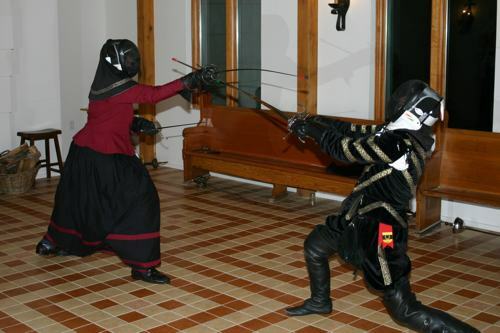 SCA rapier combat attempts to recreate civilian or unarmored combat from the late 1200s through Shakespeare's time. We use thrusting and slicing cuts as well as secondary weapons, such as daggers, extra swords, etc. We also use non-linear movement and even have melees! For more information, including the official rules, visit the Æthelmearc Rapier Combat page. Join the fencing e-mail list here. Sundays, 2:00 – 6:00 p.m. at the Pittsburgh Chinese Church, 8711 Old Perry Hwy, Pittsburgh, PA 15237. Parking: Park in the down-slope lot off of Highland Rd, walk around the side of the building, enter the first door, and walk up the stairs to the room on the 3rd floor. Helpful picture here (entrance is at the pin). Doors open no earlier than 2pm. Loaner gear is available for beginners. The first Sunday of each month fencing practice will be at the Broken Plow HEMA Group (201 Crawford Run Rd Creighton, PA 15030) starting at 1:30 pm. This is a regular practice and full loaner gear will be available. For more information about the youth combat program in the Debatable Lands, contact the Fencing Marshal. Please report any errors to the BMDL Web Minister. This page was last revised on November 26, 2018. There have been views.